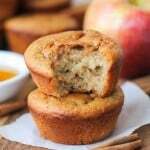 Grain-free apple cinnamon muffins made paleo using almond flour. 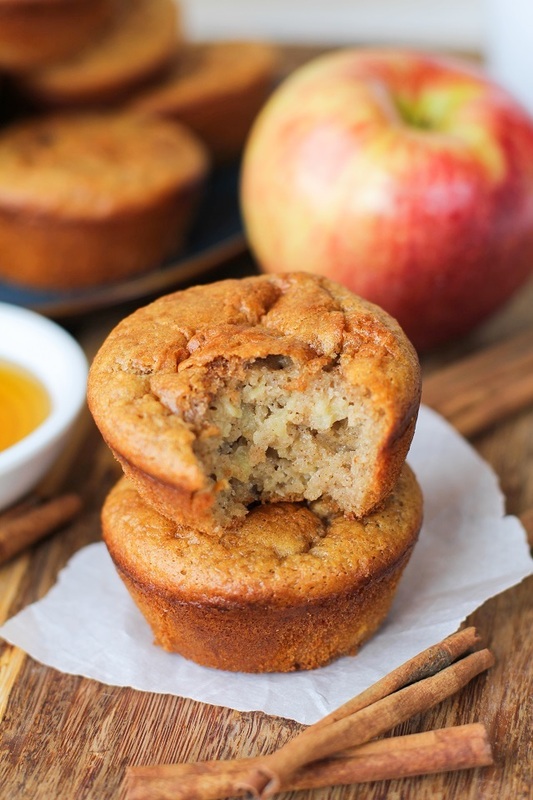 These healthy muffins are a breeze to whip up and are packed with warm fall flavors! Many thanks to Bob’s Red Mill, for sponsoring this post! For more tasty recipes and a coupon for $1.00 off any product, please visit BobsRedMill.com! Did I ever tell you I was a snowboard instructor back in my college days? I basically lived on cheese and crackers, frozen toquitos, cheap beer and $0.50 well drinks from my favorite local dive bar. You know that saying, “Never go to a second location with a hippy?” Well, I say always go to a second location with a mountain hippy. Because that location is probably a bar. And that bar probably has $0.50 well drinks. And if a mountain hippy buys you a $0.50 well drink, she’ll probably feed you a brownie that she made out of a box by just adding water. Such was my life during those winters: baking out of boxes while it stormed outside, teaching the fine art of knuckle dragging and playing on the slopes between lessons, getting tipped in denominations other than dollar bills, struggling for real, but never actually feeling the struggle. It’s looking like a winter wonderland here in the Sierra Nevada! Mother nature unloaded a hefty batch of snow on us yesterday afternoon – from the high elevations all the way down to the valley floor. Fingers crossed this trend continues -we need all the El Niños we can get! It goes without saying that baking is one of my all-time favorite snowy day activities. Coupled with a steamy hot toddy? I can’t think of anything better than hulled up during a snow storm, baking at 350 while sipping on booze tea. Okay, I can think of one thing that’s better…a kitten sneezing 12 times in a row while wrapped in a fleece blanket. But that’s about the only close second I can think of. I made these grain-free muffins with Bob’s Red Mill’s Blanched Almond Flour and Tapioca Flour, yielding a super light and fluffy muffin that you’d never realize is packed with protein and is 200% great for your bod. Also, check it: Bob’s Red Mill is having a uuuge 50% off sale on all your baking essentials right now – including almond flour! You can stock up for the holidays and make this recipe in triplicate. AsIwassaying, I’m a big fan of the almond flour and tapioca flour combination, as I find it yields amazing soft, airy results. As the story goes, a little baking soda action gives the muffin some rise and crisp around the outside, the honey, cinnamon, and apple some natural sweetness, so that before you know it, you’re eating a muffin you’d never know was gluten-free grain-free, and paleo-friendly. Per usual, I didn’t make these muffins super sweet, so that you can slather them in butter and honey upon serving, or leave them to their subtle sweetness. As strange as it may sound, I envision serving these muffins with a uuuge bowl of steamy beany turkey chili, like you would cornbread. I mean, doesn’t that just sound like a kitten sneezing 17 times in a row while wrapped in a fleece blanket? I think so! Preheat the oven to 350 degrees F and lightly oil a 12-hole muffin tray. Stir together the almond flour, tapioca flour, cinnamon, baking soda, and sea salt in a mixing bowl (dry ingredients). In a separate bowl, whisk together the eggs, coconut milk, coconut oil, honey, vanilla extract, and lemon juice until well combined. Stir in the shredded apple (wet ingredients). Pour the wet ingredients into the bowl with the dry ingredients and stir well until combined. Fill muffin holes with batter - the muffins won’t rise very much, so you can fill the holes almost to the top, leaving a small amount of space for muffin growth. Bake on the center rack of the preheated oven for 25 to 28 minutes. Remove from oven and allow muffins to cool at least 20 minutes before running a knife along the edges of the muffins to release them from the tray. Serve with butter and honey! I am SO not ready for the snow, though it certainly doesn’t help that I don’t know how to snowboard/ski/perform any cool winter sport. I can barely make a snowman. HOWEVER, I CAN bake (sometimes), and these muffins look absolutely perfect for a chilly day. Almond meal is the best! Love that these are grain-free and I love the apple cinnamon flavor 🙂 Pinning! haha yup, I was once a boxed brownie mix person with water too! 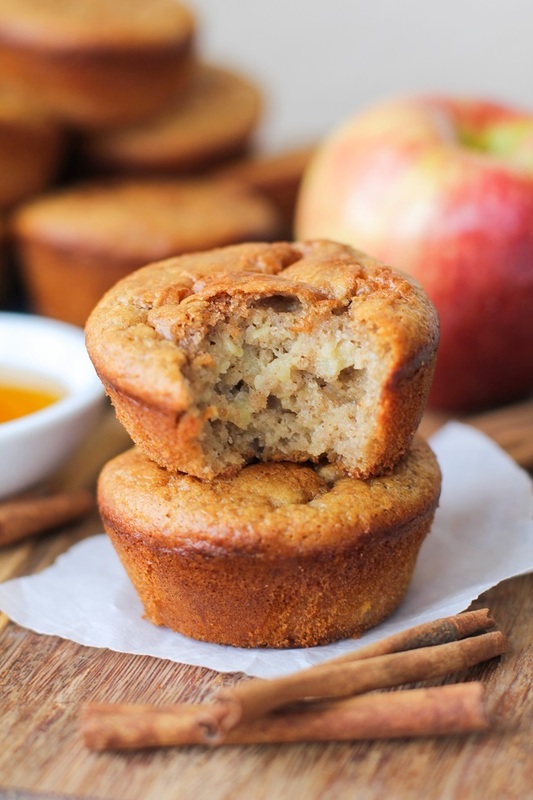 This muffins look so so good – I always love the cinnamon apple combo this time of the year!! You were a snowboard instructor? That’s awesome! I always wanted to learn how to do that, but I’m too much of a klutz. I could barely get skiing down as it is 😛 LOVE these muffins m’dear! Pinning! Love love almond meel. These look delicious! You have snow already? Brrr! I think we are due for our first snowfall fairly soon here in Southern WI, too! What would you recommend as a vegan sub for the eggs in order to achieve a similar result?